As a leading provider of packaged optical fibers for over a decade, our team at M2 has come across a lot of different setups for working with optical fibers in the testing environment. While we often assist customers with new fiber requirements, we also receive a lot of inquiries that say something to the extent of “I already own a lot of fiber, but I am not seeing consistent performance, how can I improve this?” or “We have fiber spools, but I’m not 100% certain what type they are and/or if any may be damaged – can you help?” As a result, we wanted to share a few straightforward tips and practices that one can follow in order to ensure you get the most out of your fiber spools. While your first reaction to the above statement may be to cringe at the idea of having to spend money, the word “invest” is used because taking this action is both a necessary step and one that will provide long-term benefits. A quality enclosure will protect against damage to both the fiber itself and the connectors, which occurs pretty regularly when using and handling unsecured fiber spools. By protecting the fiber from breaks or bends (which are not often easily visible), you can ensure that your fiber will offer consistent performance over the long-term. 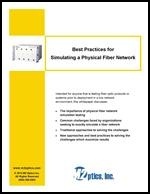 Optical fibers are more easily identified and organized when packaged into a suitable enclosure. In this manner, you know what you are working with and do not have to waste time finding and trying to determine that what you are using is indeed the correct optical fiber. A quality enclosure offers a more professional look, which is something not always considered when using optical fibers. Many test labs often receive visitors, from business partners to customers, so it is important to have a nice setup. When your most important customer comes to see a new product that you claim will meet their requirements, which will give them more confidence – a bunch of spools laying on a bench with exposed fibers all over, or an organized rack or shelf setup? The answer is clear and this does in fact make a difference to people. Ultimately, it comes down to the question “do I invest a little bit extra now, or do I run the risk of having to invest a lot more later if/when we have an issue?” By making the extra investment now, you will be a lot happier knowing that you are getting results that you can rely on, while improving testing practices in the lab. In addition, a quality vendor will be able to work closely with you to determine and customize the most ideal setup for your requirements, while offering a number of enclosure types for you to choose from. Since there is so much information out there as to why connectors should always be clean, I won’t go into too much detail on this topic. This should be a common practice of anyone working with fiber optic equipment and it is no different when testing with your optical fibers. Even when your optical fiber is protected in an enclosure and you have followed all other best practices, a dirty connector will still lead to undesired results. There are a number of very useful cleaning devices that make it quick and easy to clean the connectors of your fiber spools and connection cables, so always incorporate this into your testing procedures. By following these practices, it will go a long way to ensuring that you are getting maximum benefit out of your optical fiber spools, whether they are brand new or ones that you already own.